Yesterday I had the chance to get a quick lunch with sensei after the “memorial day”. In the past these opportunities were not rare but today I consider it a luxury to be able to speak with him directly with only the two of us. During a recent class we trained some mutô dori technique and sensei explained that in this situation you have to move forward the cut with your guts. Courage is one thing we learn in the bujinkan. When you a re facing a naked blade, a 真剣 (shinken) one needs 大勇 real courage (taiyû) or 雄武 bravery (yûbu) to move forward. But as he said if you trust yourself then nothing will happen. It is the same thing we experience in taijutsu. If you are ready to get hit, somehow you will never be hit. The same happened against the sword, but you have to have good basics in order to survive. Sensei explained that when dashing forward bravely against the sword (yûshin 勇進), you should never watch or consider the blade itself but the position of the attacker’s hands. As I often tell my students concerning weapon traiing. A weapon has no intention so if you want the weapon to be harmless you have to deal with its brain i.e. the opponent. When you visualize the trajectory of the hands in the air you can determine where to go, the timing of your action, and the position of the body. But this is more a yûgen thinkg than a proper thinking process. You have to get the intuition and move with a yûshin attitude. Then nothing bad will happen. Recently I read in some forum comments speaking about the sword techniques of the bujinkan ryûha. This surprised me as I thought that only the kukishin ryû and the togakure ryû had sword techniques in their densho, so I asked sensei over lunch. In life I believe that if you want to improve your knowledge and know the truth 真理 (shinri) you should always go to the source. The source concerning the bujinkan is Hatsumi sensei so the truth of the sword in the bujinkan comes from the sôke (my Japanese abilities being very “light” to say the least, the whole conversation was done in Japanese but mainly in English and was translated to me by Shiraishi sensei). Shinri is, that there are no other densho about the sword in the bujinkan densho apart from those of the kukishin ryû and the togakure ryû. Shinri is, that we train juppô sesshô since 2003 and that we must use any weapon with the feeling (kankaku) of any of t he nine bujinkan schools. Shinri is, that whatever we do today it is always a mix of the nine schools. They add to one another in our body and mind and this is true also for the sword too. Last year in 2011, the secondary theme for the year was the shinden fudô ryû sword. During my three stays in Japan, sensei taught many sword concepts related to the shinden fudô ryû. There were no techniques but the interpretation on how to use the sword with a shinden fudô feeling. The internet is full of these wrong interpretations and instead of spreading them it is always better to ask directly to sensei. For many years this is what I have done and I invite you in the future to ask him before spreading any wrong or unverified information. As I wrote in another previous article, the bujinkan is shindô a true path. This shindô exists in every move we make in and out of the dôjô. 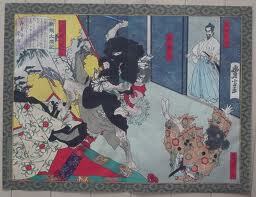 In mutôdori training the shinken is dealt with shinyû in order to find the shinri. Bujinkan is shindô, shinken, shinyû, shinri. Remember that the internet is not shinri. The internet is shinshaku 新釈, a new interpretation often wrong by people not connected to the source. I invite you to spread this around you so that fake comments on the bujinkan sword are not believed anymore. Shinri exists only in training. I have heard that the shinden fudo ryu has it’s own sword, bigger than a katana and that Iaijutsu may have originated from Shinden fudo ryu, is this true or do you know anything about this. not trying to start any debate or anything just interested in sword.